willohara on Wed, 2005-08-17 07:14. Microsoft have announced at the German Games Convention in Leipzig, that the Xbox 360 will retail at £279 in the UK, €399 in Europe and $399 in the US, including the accessories pack. It will be out "in plenty of time for the Christmas market," European home and entertainment head Chris Lewis said. So I have to pay USD$500 for my xbox in the UK? GerBot on Wed, 2005-08-17 09:46. DigitalGhost on Wed, 2005-08-17 11:32. They've also anounced that there will a peripheral device ID check. So peripheral manufacturers will have to get a license to create peripherals for the system. And, game developers get hit too. 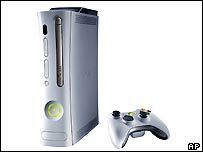 Some Xbox 360 systems will have a harddrive, some won't. So game developers won't know whether they should develop for the systems with harddrives, or the ones without.